Drones have evolved as one of the hottest event tech trends, and are being used in a wide variety of events. From indoor gatherings to outdoor festivals, drones are providing entertainment, advertising, security, engagement and more. Drones can definitely be an exciting addition to your event. However, you need to consider your goals before you invest. Also, you need to be aware of the laws & regulations of the local area before you use them for your event. 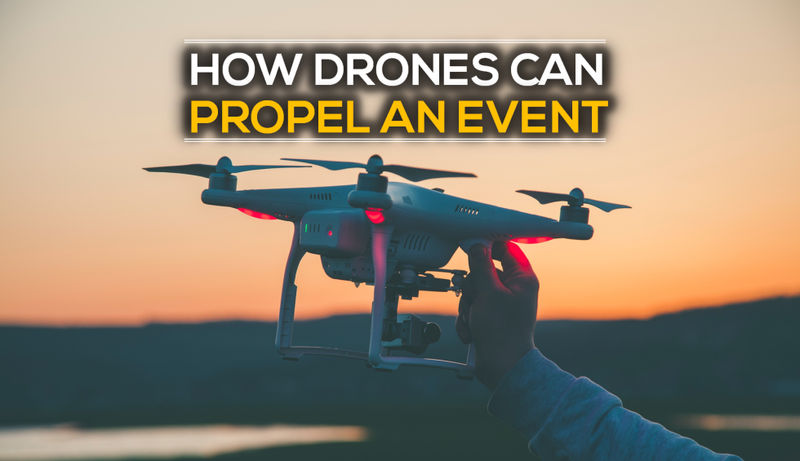 We all know drones are chiefly used to take pictures and videos, but how can you use them in an innovative manner to up the perceived value of your event? Substituting traditional surveyors with drones can save you time as well as capital. Drones can survey a site and detect geological elements with LIDAR sensors to formulate 2D and 3D maps of an area. Drones can also map out any event locations in the future, making planning a breeze. Drones can serve as mobile hotspots too. If you wish your event to have boosted internet speed or network connection, consider a drone hotspot. Your attendees will greatly appreciate the added advantage. 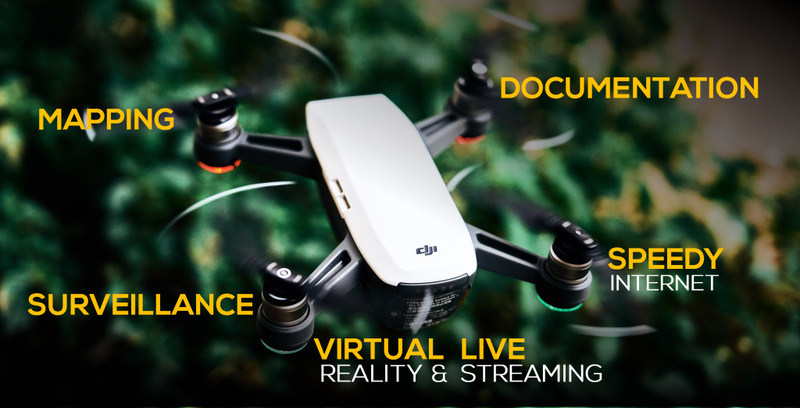 Drones are sensational VR tools as they permit you to thoroughly capture shots to produce an immersive VR experience. You can utilise them to capture a 3D plane of your event location and then convert it into a VR experience for your audience. Live streaming is another tool that drones arm you with. This feature allows viewers to feel that they can “move around” within the event thereby giving them the feeling of truly attending the event. Drones at events can also be used as security cameras, but with more versatility. Surveillance is one of many innovative methods to use drones. Since drones can monitor an event, if something is out of the place, the pilot can follow the target, take a closer look, and even emit a warning. Documentation is one of various drone footage ideas. You may document your event for several purposes—research, security, marketing. Set up drones at your event to record stunning key angles such as the entrance door to document who attended, or the wedding altar to remember that special moment. With Shobiz on board as your experiential event partner, you can expect cool technology, gizmos and devices that will attract a larger than life audience. We curate new tools which hold out the promise of a different experience and invite the audience to enter into a conversation with the brand.